I am not sure how many people know of these things, but there are phones near each characters ritual site that state a bit of back story about them or about the map. There also seem to be phones that can only be accessed after a ritual, showing that resorting to murder was not what the characters had to do and they were actually going to be able to live a fine life. For example for Vincent, a phone can be found near the perk spawn of the Canal District that alludes to his partner possibly ratting him out. But then in the Ruby Rabbit, after doing the ritual, a phone will be found that is form the partner telling Vincent he was questioned about him but he would have never said anything as he was his best friend and they were partners and that Vincent was not suspected in the slightest. So you essentially sacrifice the people who would have put you in the clear. I have only heard Vincents and Nero so who knows what other information there is for the others. For Nero, the phone call his form his lawyer. It turns out he has a way to save Nero from the debt. His wife had been lying about the debt that she had apparently accumulated. Yes she had gotten a debt, but she had tried to connect Nero with this. It turns out due to some banking notes or something that the lawyer found Nero could be cleared of connection to the debt as the date a certain note thing was is when he was in the hospital. He was in a coma so its impossible for him to have anything to do with this. I thought this was a strange back story for Nero, apparently he was in a coma after performing the "Amphibious Man" act. This got me thinking about a lot of things. Nero is alluded to have some great trick linked to tentacles at least, as shown by his posters, but what if his trick was something a lot more sinister? What if Nero had somehow unlocked the power of the Cursed and used it as a trick. It is a great trick after all, a man changes into an Amphibious being before your very eyes. Nero does make a quote saying "What if we always held this power." Or something along those lines that alludes to the fact that he is aware the curse power is not something new the characters have. Then there is also him making reference to seeing the Shadowman in a dream. This could be a dream from when he was knocked out, but why would he be the only one to dream of the Shadowman while he is on his cursed rampage? I believe his dream to of been when he was in a coma. He doesn't even hesitate to follow the Shadowman, you get the others having great doubt about him while Nero says "What will you have us do?" or "I think we should really really listen to him." This also leads me to another small idea I had that could be linked to this coma. Nero is in a coma at a hospital. He is essentially a failed magician which could have been caused by the Amphibious Man trick failing. But who else is a failure at their profession and was stuck in a hospital? Weasel. I cannot align their dates to being together at the hospital but some strange stuff seems to have happened to the both of them and they were both in hospital at some point. I am not really sure how any of this fits together, but maybe somebody else does and can make sense of all this. I know for a fact when you ride the Tram for the first time from one District to another. Upon arrival you will hear the phone ring right outside the Tram. If you answer you'll hear A reporter every time saying, " Hey Mr. Rat". The first time he talks about the "Meteors" (Meatballs). The second time I believe about the Fungus/Growth in the dark alleyways (The Harvesting Pods). Finally on the last phone call he talks about the "Order of the Keepers" & a Cult. The weird part is every single time he answers the phone he says , "Hey Mr. Rat" the last one he also states that he's looking forward to actually finally meeting him. I know with Campbell (The Boxer) one of the phones is an interview with the guy he's fighting manager. He talks about why he wouldn't fight the #1 contender, but instead a nobody that will be easily defeated. Jessica's phones can be found in front of the build table in the City. The after Ritual one is on the right side of the Bar facing the city. I thought this was a strange back story for Nero, apparently he was in a coma after performing the "Amphibious Man" act. This got me thinking about a lot of things. Nero is alluded to have some great trick linked to tentacles at least, as shown by his posters, but what if his trick was something a lot more sinister? What if Nero had somehow unlocked the power of the Cursed and used it as a trick. It is a great trick after all, a man changes into an Amphibious being before your very eyes. Nero does make a quote saying "What if we always held this power." Or something along those lines that alludes to the fact that he is aware the curse power is not something new the characters have. Every character has a quote about hypothetically never being able to change back from a Beast, so I think this is alluding to that, not that he knew of these creatures beforehand. This isn't to say he didn't know of them, but this quote doesn't support the theory in my opinion. I believe the meteors he's referring to are actual meteors, likely containing Element 115 and creating the zombies, like in Shi No Numa. anyone ever try to be in Beast mode and jump into the water near the waterfront? Yes, to no avail. But theater mode shows boats under the boats (as I've seen pictures of, no theater mode on my 360). Oddly, as a solo game loads, there is something shining/shimmering in the boxing gym that does not match anything in game. You can see it through the side windows. The poster in Nero's landing says 'Nero knows all' or similar. Also, in the mp load screen, he is the focus character, larger and above the rest. His ritual location is first and different from the rest, but that could just be the map layout without it meaning anything. A room of secretS. He was in a coma and so couldn't sign the loan papers, showing that his wife forged them. He says, after beast, 'if i could have done this in my shows, i would have brought the house down' (or similar). So he clearly hadn't done this before. Still, I think he did something linked with becoming an amphibian considering, but it failed. Maybe had used some lovecraftian ritual that failed? I also just found out that Vincent makes a quote about Al trying to blow a bank vault open and almost blowing himself up. Something I could imagine him being put in hospital for and then taken to prison after. I was hoping that someone else would notice the phone calls. I first noticed them after doing each ritual. The phones would be in the ritual rooms. I want to try to listen to all of them in the same game. "I once busted a little weasel who tried to use one of these to blast open a bank safe. Dumbass nearly blew himself up." I think the posters are more linked with the whole "Nero is arrogant" thing that basically everyone forgot about because he's less arrogant then ANY of the O4, N4, or any other character ever. Honestly the backstory to all 4 characters basically died after the cutscene and was replaced with "MARGWAS, SSSHHHHADDDOWWWMANNN, TENTICLES! BAHFOJDSFIJNE........."
He makes a quote about all of the other characters, their is no way that it is not Al. I hope people don't start saying it isn't, it obviously is. We seem to be discovering alot more references between the Mob of the Dead & Shadows of Evil Groups. Yourself & @Tac have made some great points above too. That's a cool quote. @Nightmare Voyager maybe you could make a nice detailed post of all the subliminal links/references? Also want to post this again. This is too much of a coincidence. Al gets a Sniper rifle from the Mystery Box & says this quote. talking about a Magician having a magical cabinet that looks like the Mystery Box. Then on the Roof you get a jump scare which could be Nero? Is the Mob of the Dead Jumpscare really Nero? Also trying to find one of the MotD Cell Ciphers. Pretty sure one of them talks about being in hospital? If it is from the Weasel's perspective, this could be what Jack Vincent is talking about? Weasel blowing himself up? 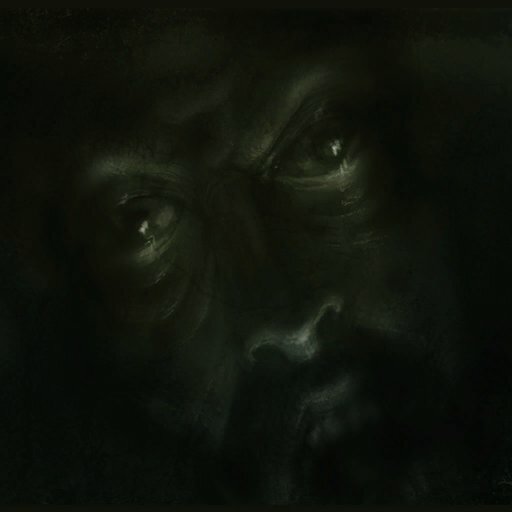 It makes more sense for the jumpscare too be Maxis, I say this every time because of the fireworks and time of making the art for Maxis in the intro. 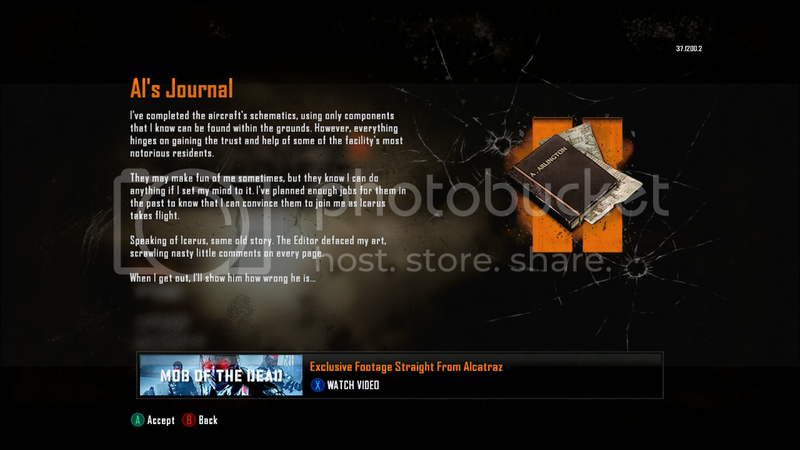 The hospital thing is Al's Diary thing from the menus. That is how I know he was in hospital, thought it was common knowledge. He just talks about showing the editor that his art isn't bad. @Nightmare Voyager Yep, just checked the Cell ciphers, Milo has decoded these a few weeks ago & there is no mention of the Hospital. Knew I read it somewhere. Thanks for telling me that it was from the Diary Entry. As for the jumpscare being Maxis? There is no other link to him or the orginal story in MotD. The Fireworks are a reference that it is New Years Eve. You can do an Audio Tour of Alcatraz (which Treyarch did) & there is a prisoner that talks about hearing the Fireworks on New Years Eve & the sound of all the people (& women) laughing coming across the Bay. Treyarch tool LOTS out of this tour. Hence the Audio Headphones at the end of the Easter Egg. If you get a chance, Youtube "Alcatraz Audio Tour"
Agree to disagree on the jumpscare, but as yourself have posted above, there seems to be lots of interactions between these two groups. I still think a detailed thread (even if there are some speculation parts included) would be pretty cool. I'm sure there would be alot of things by the end. EDIT ~ Just looked at Al's Diary, it doesnt' say anything about a hospital? just says "When I get out"
He says it somewhere. I am too ill to go searching for it but I don't think it was a cipher. I believe that the only other person he references is O'Leary. And as of now, I'm not going to say it's a reference to him, though I won't at all be surprised if it is. As for the hospital, it is in the cipher.